This guide is for small businesses filing their tax returns on Schedule C with their personal returns (Form 1040). It includes sole proprietors and single-member LLC, owners. If your business is a corporation or S corporation, check out the Complete Guide for Corporations and S Corporations, If your business is a multiple-owner LLC or a partnership, here is a Guide for Business Taxes for Partnerships. Because small businesses file their business tax returns with their personal returns, the due date is the same as the personal income tax return due date: April 15. If the due date falls on a holiday or weekend, the next business day is the due date for that year. Do I Need a Tax Preparer? 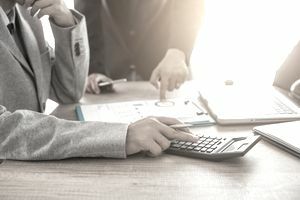 A very simple small business with no cost of goods sold or assets to be depreciated might be able to use a tax software program, but most small businesses need a tax preparer. Partnership income taxes can be very complicated, and even a simple Schedule C might be more difficult than you think. Before you enlist the help of a CPA, Enrolled Agent, or another qualified tax preparer to prepare your business taxes, use the information in this guide to help you get ready for business taxes. If you have an inventory of products or parts, you'll need information to calculate cost of goods sold. Information to prove all business tax deductions, including information on the costs of business travel, driving expenses, and business meals (entertainment expenses are no longer deductible as a business expense). Information on costs for buying business assets like vehicles and equipment, to calculate depreciation deductions. If you work from home, include any information on the business use of your home, for a home business space deduction. Small business owners must pay self-employment taxes (Social Security/Medicare taxes). A tax software program or tax preparer can calculate this tax for you, or you can run the calculation yourself using Schedule SE. Your business net income on Schedule C (Line 31) is added to your personal income tax return on Line 12. Any tax credits or other business adjustments you are qualified to receive are added in the Adjusted Gross Income section, including half of your self-employment tax liability (Line 27). The self-employment tax you owe (from Schedule SE) is entered on Line 57. You can file your tax return by mail or you can e-file the return. The last page of the instructions for Form 1040 lists the addresses to use for mailing your tax return to the IRS. If you are using tax software, the e-filing fee will be included in your cost. If you are using a tax preparer, this cost is also included. You may apply for an automatic extension of time to file your taxes, including small business taxes. The extension is for six months for non-corporate tax returns, so the due date for the return is October 15 (unless October 15 is a weekend or holiday, in which case the due date is the next business day). Your extension doesn't include an extension for payment. You must pay your taxes due by the April tax return due date. If you make a mistake on your tax return, whether the error is due to your business or personal taxes, you must file an amended return. The form to amend your tax return depends on your business type. To amend your personal return, including Schedule C, use Form 1040X-Amended Return. If you don't pay enough taxes during the year, you must pay estimated taxes. Many small business owners must pay estimated taxes because they don't earn a salary, so no taxes are withheld from their income or self-employment. Estimated taxes are due quarterly: April 15, July 15, October 15, and January 15 of the following year. If you and your spouse are joint owners of a partnership, you may be able to file a qualified joint venture. It means filing two Schedule C forms, for your respective shares of the business. It's complicated, so check with your tax professional to make sure you and your business qualify.